Gunnera manicata is one of the most astounding plants you will ever see. The larger specimens of these ornamental giants can be quite expensive but don’t worry, collecting gunnera seeds and growing plants from them is easy. There are just a few crucial items to know about gunnera seed propagation to ensure success. 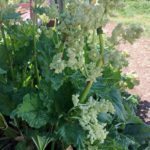 Read this little article for some tips on how to propagate gunnera from seed and grow your own giant rhubarb. There are over 50 species of gunnera, but the most impactful is the huge Gunnera manicata, which is native to the mountains of southeastern Brazil. This monster of a plant can have leaves of 11 by 6 feet on petioles that are 8 feet in length. It is the most common in cultivation and harvesting seeds from the plant is relatively simple but they need special treatment to ensure germination. Seed propagating gunnera plants requires exacting temperatures and careful handling of the seed. Gunnera plants produce large brownish panicles filled with tiny red-brown flowers. 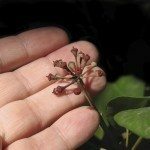 Pollinated flowers become small red berry-like fruits. Once ripe, these fruits are filled with numerous fine black seeds. These seeds are sensitive to handling and the oils on your skin can affect germination. When harvesting seed, wear gloves to prevent contamination. Seed propagating gunnera plants is not the only method of reproduction. Another common and quick method is by dividing the root ball and planting the resulting individual babies. Growing gunnera seeds is a much slower process but you can get many more starts and have the fun of watching these monstrous plants grow from pups to huge garden specimens. Once the panicles produce fruit, wait until they are ripe and bursting before harvesting them. Open fruits over a container to collect the tiny seeds. 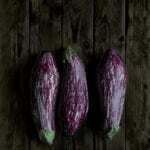 Use them immediately for best results or refrigerate them for a short period. Always use gloves when handling seed. Sow in a flat filled with good moistened compost mixed with vermiculite or perlite. Seeds should be lightly strewn at about one inch apart. These seeds need light for germination so you can simply lightly tamp them into soil or gently cover with a fine layer of sand. Cover the tray with plastic or glass and place where temperatures are 68 to 77 degrees Fahrenheit (20-25 C.). 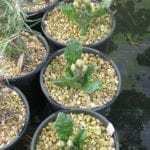 Best gunnera seed propagation is achieved in warmer temperatures. Bottom heat will speed germination. Remove the plastic or glass once every day to allow air into the area and mist to keep moist. Germination is generally quite quick, within 15 days, but may take up to 60 days. Thin is necessary and grow the seedlings on in their flat until two pairs of true leaves appear. Then transplant to 2-inch pots filled with good compost. Keep them moistened and provide ventilation in a warm area of the home, garden or greenhouse. Lighting should be bright but not scorching. It is important to not let the seedlings dry out. Give seedlings a liquid diluted fertilizer once per month during the growing season. Do not transplant outdoors until young plants are a year old. Protect plants in the garden from freezing. In a few years you, will have your own giant gunnera plants, a sight which will amaze and awe your friends and family. Read more articles about Gunnera.